A colleague welcomes Egyptian Al-Jazeera English journalist Baher Mohammed, carrying son Haroon, upon his arrival in Doha, Qatar, Oct. 14, 2015. Baher Mohammed, the last of three jailed Al-Jazeera English journalists to leave Egypt, arrived Wednesday at the network's home base of Qatar to the smiles and hugs of co-workers who had pressed for their release. Mohammed, who is Egyptian, was arrested along with his colleagues in Cairo in December 2013. He and Mohamed Fahmy were sentenced in an August retrial to three years in prison for airing what a court said was "false news" and coverage biased in favor of the Muslim Brotherhood. They were released from prison after receiving a pardon from Egyptian President Abdel-Fattah el-Sissi in September. Fahmy, a dual Canadian-Egyptian citizen who renounced his Egyptian citizenship in an attempt to facilitate his release, left Egypt last week. A third colleague arrested with them, Australian Peter Greste, was deported from Egypt a year ago but was nonetheless convicted in absentia. He has not been pardoned. "It feels good to be back and see those who supported me,'' Mohammed told The Associated Press after his arrival in the Qatari capital, Doha. "I didn't know what to say. I was just saying lots of thank you's." Mohammed left Egypt without fanfare last Thursday for a short getaway with his family to the Indian Ocean island nation of the Maldives, he told AP. He said authorities initially stopped him from leaving Cairo airport, forcing him to miss his planned flight out, but he eventually was allowed to depart. 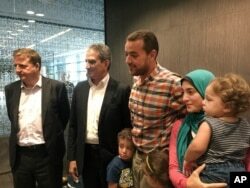 Egyptian Al-Jazeera English journalist Baher Mohammed and his family are welcomed by his colleagues in Doha, Qatar, Oct. 14, 2015. On arrival in Doha, he clutched his son Haroon, whose August 2014 birth he had missed because he was behind bars. Mohammed plans to continue working for the network, which he said took good care of his family during his ordeal. Just not quite yet. "To be honest, I need a break,'' he said.